Thanks to Sam Sifton from The New York Times, we learned of a new brunch place to try. We got to the diner at 11:30am on a Saturday morning and only had to wait 45 minutes. Luckily, it was a really nice day, so sitting outside in the sunshine was quite comfortable. I kind of felt like I needed to be wearing a plaid shirt to fit in with the hipster-ish setting. A simple, no-fuss, plastic-covered menu. 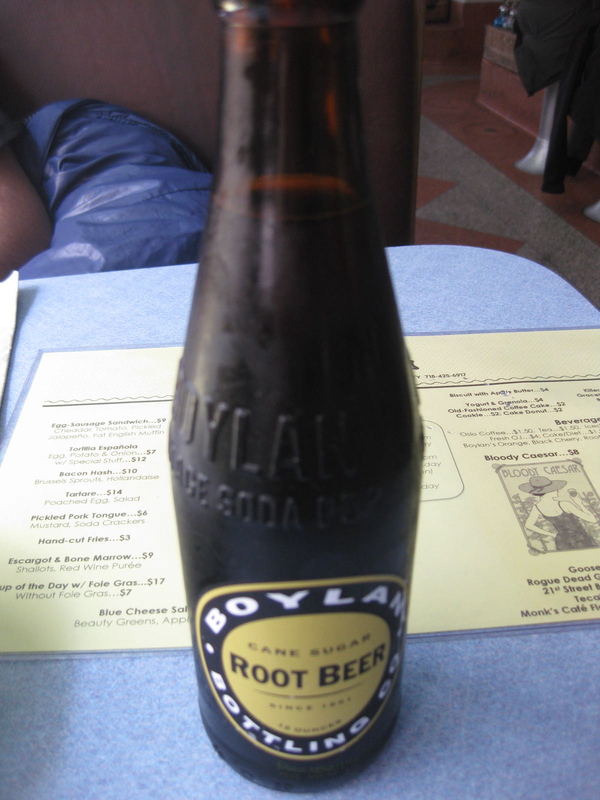 My root beer, $2.50. Root beer reminds me of summers spent at my grandparents' house in California. Loved this bottle. 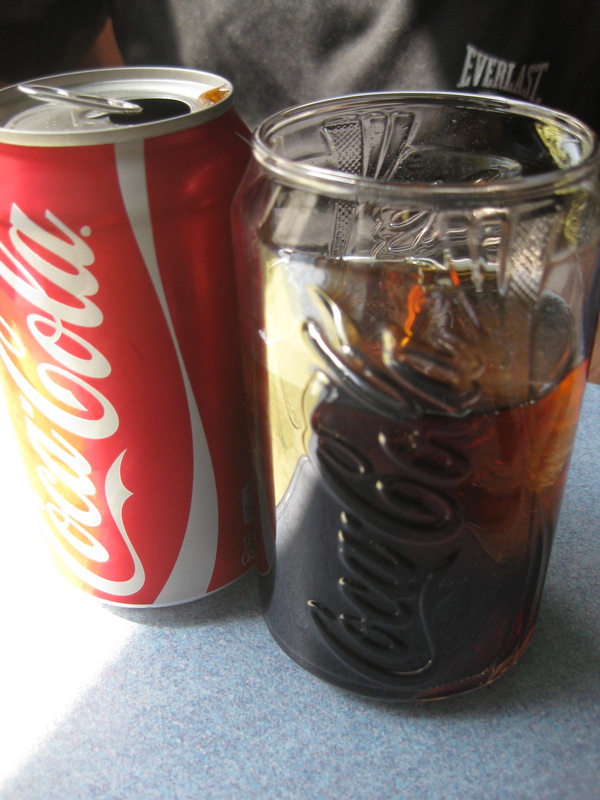 Really cool glass for coke. Canned sodas, $1.50. 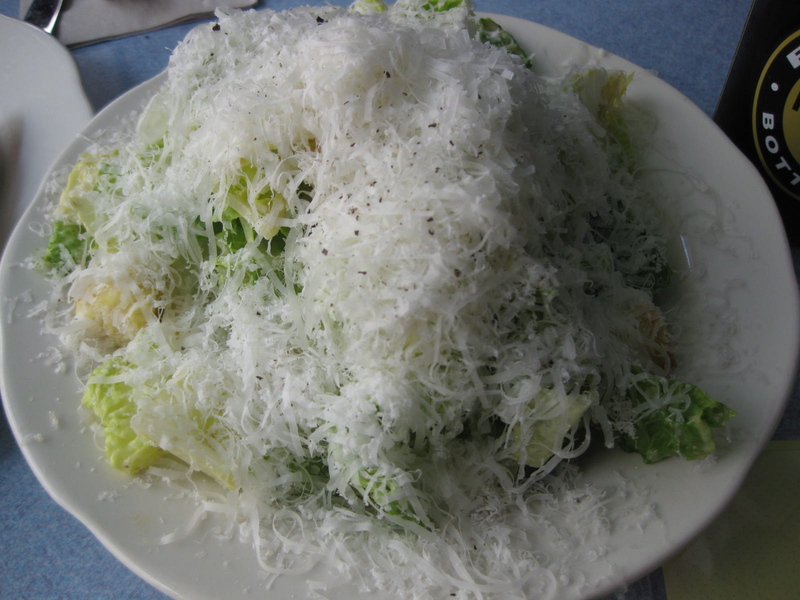 Caesar Salad with smoked herring dressing $7. To be honest, I thought the herring tasted a lot like anchovies, which I really like, so I definitely enjoyed this salad. The finely shaved parmesan cheese was fun to eat too, it was so light and fluffy. Escargots & Bone Marrow with red shallots and red wine puree $9. Such a bargain for this little dish of heaven. Every bite had so much flavor! Although some bites were a little too salty, combined with the grilled toast it was absolutely wonderful. Egg Sausage Sandwich $9. This sandwich was a little too pork-y tasting for my liking, but my sister really liked it. 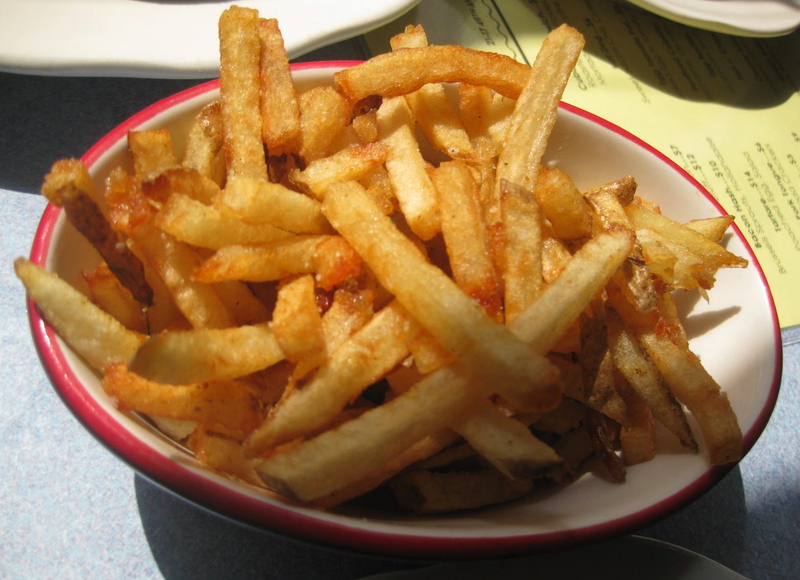 Hand-Cut Fries $3. Probably some of the best fries I've ever had. Slightly browned, nice and crispy. Cubano, pork panini $7. I don't think I've ever complained about any panini. This was delicious because of all the whole grain mustard and meats. I did have to open the sandwich and cut off some of the fat on the pork, though. Banana Cream Pie $5. It took us a moment to decide between this and maple pie, but I'm glad we went with the banana cream pie. The cream was so fresh, the custard wasn't too sweet, and the crust was very flaky. Not your typical pancakes/omelets brunch fare, but a great variety of lunch foods.